American consumers spent no more in June than in May, even as personal spending rose, according to the Bureau of Economic Analysis. Spending on gasoline fell along with gas prices, but consumers weren’t spending those savings elsewhere, which raised the personal saving rate. 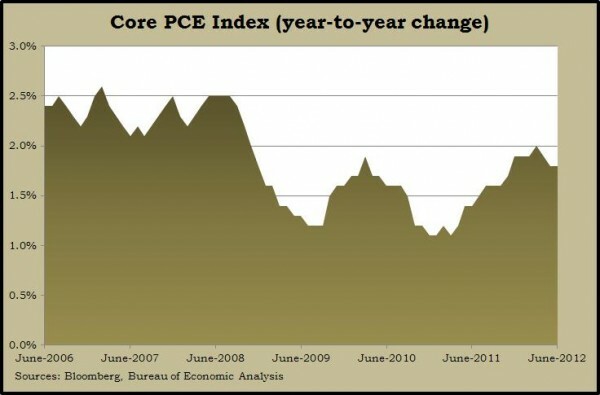 The report included a key inflation measure that rose 1.8% from June 2011 – within the 2% range preferred by the Federal Reserve. A precursor to freer spending, consumer confidence, rose a little in June, slightly more than forecast. But it remained at an historically weak level. The Conference Board said its index nudged up after four straight months of setbacks. The beleaguered housing market showed another sign of stabilizing, according to the S&P/Case-Shiller Home Price Index for May. The slump in year-to-year house prices narrowed for the fifth month in a row, reaching its narrowest point since the double-dip housing recession began in October 2010. 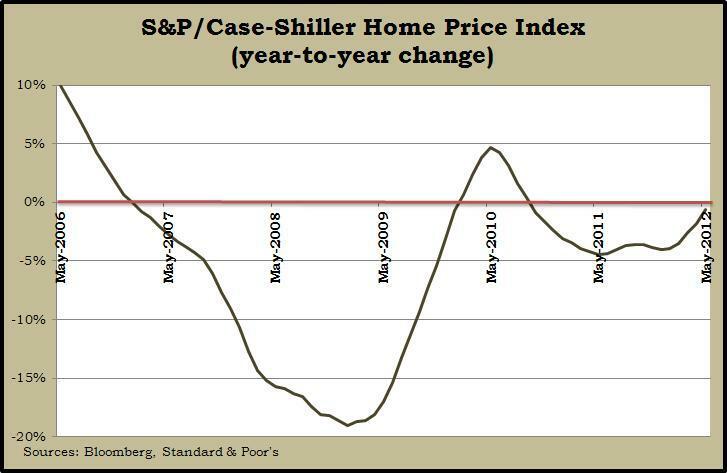 An economist for S&P cautioned that seasonal buying could be affecting the data. 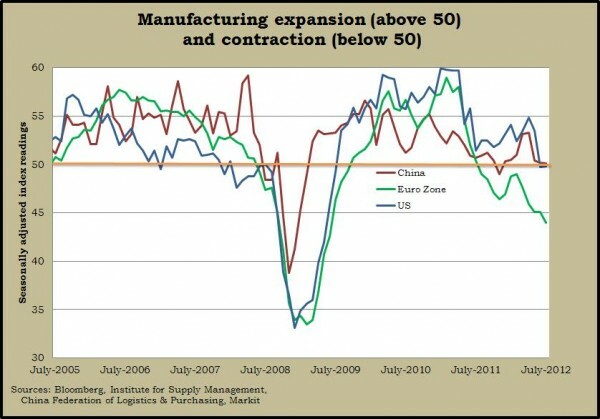 For the second month in a row, following 34 months of expansion, the manufacturing sector contracted in July. Declines in new orders and inventories were slighter than in June, the Institute for Supply Management reported. Employment and production components showed growth, but prices for raw materials fell for the third month in a row, indicating lower demand. Another sign of a possible housing rebound came from a Commerce Department report that construction spending rose in June. America spent more money on both single-family houses and multi-family units. Led by the private sector (with public expenditures down from the year before), construction spending grew 7% from June 2011. That was the eighth consecutive month of year-to-year increases. Americans bought an annual rate of 14.1 million cars and trucks in July, according to the industry group Autodata Corp. The rate dipped 2% from June but was nearly 14% greater than in July 2011. Cars sold at a faster rate than trucks, and domestic vehicles outpaced imports. The data offered some encouraging news on consumer spending. 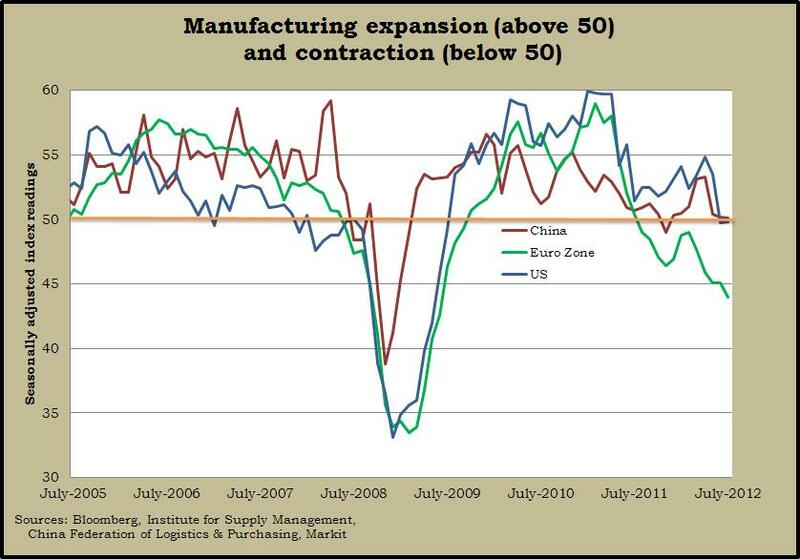 A slowdown in global expansion appears to be eating into the 3-year-old economic recovery, as indicated by another decline in factory orders in June – for the third time in four months. If not for requests to build new airplanes, orders would have dropped even more, the Commerce Department said. Compared to June 2011, factory orders were up 5.2%, a little less than the 53-year average. The four-week moving average of initial unemployment claims dipped for the sixth week in a row and reached its lowest level since March. Jobless claims generally have been staying below the point at which new job losses don’t outnumber new entrants to the job market. Employers added more jobs than expected in July, pushing the monthly average of gains so far this year to around the same rate as 2011. Although the nation remains 4.8 million jobs or 3.5% behind the peak payroll count more than four years ago, the report from the Bureau of Labor Statistics suggests the pace is picking up from recent months. The unemployment rate nudged up to 8.3% from 8.2% in June. A broader measure that includes unemployed jobseekers along with involuntary part-time workers and discouraged job hunters rose for the third month in a row to 15%, down from 16.1% in July 2011. The Institute for Supply Management said its non-manufacturing index bumped up in July to signal the 31st consecutive month of growth for the largest segment of the U.S. economy. New orders and output indicators posted stronger numbers than June, but a measurement of employment showed contraction for the first time since December.